Houndstooth is a big trend in the winter and is worth repeating, so take it upon yourself to wear houndstooth because it is such a chic, timeless, recognizable and wearable pattern. You don’t want over powering colors, accessories, or “matchy matchy” houndstooth like pieces to mesh with your outfit because houndstooth is already striking. If you choose to wear a houndstooth dress, stick to black pumps or wedges. If you’re scared and want to test if houndstooth is right with you having small pieces of houndstooth can be a good test. A plain black dress with houndstooth accessories like a purse or shawl also looks very pleasing and gives wonders to the eye. Check out these adorable houndstooth earmuffs. A houndstooth coat can bring a modern and vintage feel to any kind of outfit. If you are attending a dinner party, wearing an oversized houndstooth coat or jacket over a flowing dress might do the trick. The subtle print on a flat, wedge, or stilettoes can easily match a dress and add additional flair to an entire outfit. Pairing them with loose tops in shades of black, grey, white and even maybe red can make a great mix to your outfit. If you're feeling bold, try some houndstooth-printed tights! 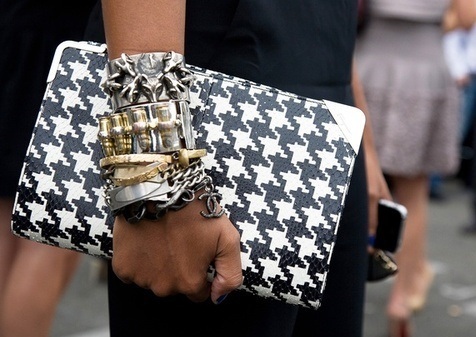 You can never go wrong with having houndstooth clothing (however, you may want to avoid wearing the print AND accessorizing with the print, like Lady Gaga) in your closet because of its number of options to mix and match, plus the sophistication and elegance that the pattern adds, it's no wonder why houndstooth never goes out of style. Selena look beautiful and chic with houndstooth..